One of the best parts of CSTL is sharing a meal together at the Kiddush lunch following Shabbat morning services. At the heart of our shul’s delicious weekly buffet is an opportunity for the shul members to laugh, schmooze, share, and toast their friends. Sponsoring a Kiddush is a meaningful way to celebrate birthdays, anniversaries, simchot, or commemorate other milestones; in addition to building the connections that make the shul a strong, vibrant community. 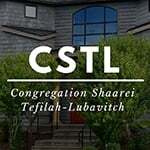 Please consider sponsoring a Kiddush lunch at CSTL for your special occasion. To avoid last minute rushes, you can reserve the date in advance. In order to give our wonderful volunteers enough time to plan the menu, shop and prepare the food, the payment for the Kiddush must be done by Sunday, preceding the Shabbat Kiddush you signed up for. Includes: Meat cholent, 1 bottle of wine, 1 bottle of grape juice, crackers. Paper goods and tablecloths. Full Kiddush - $250.00 - For a meat cholent add an extra $100. Includes: Pareve cholent. Hamotzi, 1 bottle of wine, 1 bottle of grape juice, crackers, 2 starch salads, 2 green salads or, 1 green salad and a veggie platter with dips, 2 proteins i.e. eggs and fish. Choices in each category are at our discretion. Paper goods and tablecloths. Co-sponsorship is available for the full (or more) Kiddush. This is an excellent way to celebrate special occasions in the Jewish calendar i.e. Shabbat Rosh Chodesh, the Shabbat we bless the new upcoming month, Holiday Kiddush or special Parshiot. To reserve a date for Kiddush Sponsorship, please contact MARION KITZ: miriam@hotmail.com or 206-323-9342. To pay for the Kiddush Sponsorship via credit card CLICK HERE to pay via paypal CLICK HERE and select KIDDUSH FUND.